Brands, like a person, may take on personality traits or human values that reflects brand images. These traits affects how consumers perceived those brands and may, at times, determine their buying decisions. Paul Temporal believed that brand personality can one of the foundations needed in building brand loyalty, as it affects the customers’ emotional aspects. Brand personality serves as ‘charisma’ that differentiate it from others which has emotional basis or edge to them. Brands, therefore, have a need to reflect the personalities that people like and build emotional dimension of brand – customer relationships. Brand personality tends to serve a symbolic or self-expressive function of a brand, and therefore making it possible for customers to value it solely from their symbolic use. Customers can perceive brand as an important figure and relate it with their own traits. It became a distinctive feature of a brand that correlates with customers’ emotional aspects. It is found that the greater similarities between an ideal human’s personality and that of a brand would increase customers’ preference of it. Because of it’s distinctive features that differentiates one brand from another, Azoulay and Kapferer had identified brand personality as an aspect of brand identity. Brand identity is defined as a compilation of brand elements that form distinctive features of a brand. Azoulay and Kapferer classified those elements into several aspects, portrayed by the figure below. Although it carries the same conceptualization, brand personality traits differs from human personality traits in terms of how it functions. Human personality traits are formed by an individual’s behavior, physical characteristics, attitudes, beliefs, and demographic characteristics. A human’s image will be formed by those aspects and people may perceive a person to have certain kind of personality through that conclusion. However, brand personality traits can be formed and influenced by direct or indirect contact customers have with the brand. It is formed by the association of several aspects a person may have when encountering a brand. The associations can be formed by product-related attributes, product category associations, brand name, symbol or logo, advertising style, price, and distribution channel. Brand personality traits may differ from one customers’ perception to others. Generally, a brand’s image is formed by the traits found, whether it carries the same ‘ideals’ of personality like that of a human. Jennifer Aaker classified human personality traits that are well identified with brands into five distinct personality dimensions—sincerity, excitement, competence, sophistication, and ruggedness. From these dimensions, an ideal brand personality is based of, that eventually form emotional relationship between a brand and it’s customers. 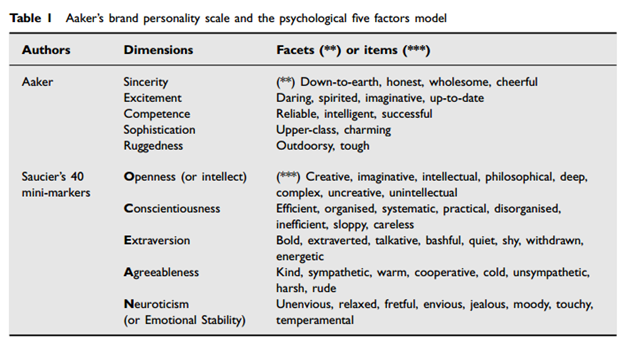 These dimensions are formed of human personality traits. These traits are consisted of five dimensions which some called as OCEAN for short—Openness, Conscientiousness, Extraversion, Agreeableness, and Neuroticism. However, the brand personality scales Aaker offered have received many criticism from researchers. Geuens, et.al. summarized the criticism those scales received into three main points—loose definition of brand personality, inability of generalization of the factor structures at respondents’ level, and the non-replicability of the five factors cross-culturally. They then offered a complete series of dimensions applicable to solve those problems that are derived from both human personality traits and researches conducted before. 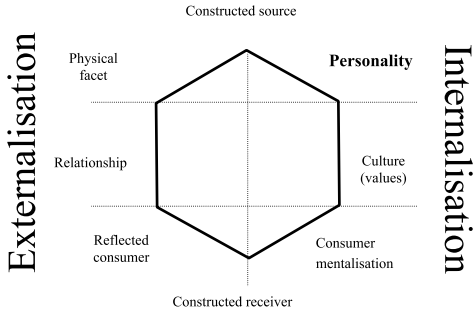 The elements of Geuens’ brand personality dimensions can be found in the figure below. Aaker, J. (1997). Dimensions of Brand Personality. Journal of Marketing Research, Vol. 34, No. 3, 347-356. Azoulay, A., & Kapferer, J.-N. (2003). Do Brand Personality Scales Really Measure Brand Personality? Brand Management, Vol. 11, No. 2, 143–155. Caprara, G. V., Barbaranelli, C., & Guido, G. (2001). Brand Personality: How to Make The Mathapor Fit? Journal of Economic Psychology, Vol. 22, 377-395. Geuens, M., Weijters, B., & Wulf, K. D. (2009). A New Measure of Brand Personality. Research in Marketing, Vol. 26, 97–107. Keller, K. L., & Richey, K. (2006). The Importance of Corporate Brand Personality Traits to A Successful 21st Century Business. Brand Management, Vol. 14, 74–81. Paul Temporal, Advanced Brand Management: Managing Brands in A Changing World, (Clement Loop: John Wiley & Sons, Inc., 2010), pg. 31. Kevin Lane Keller, Strategic Brand Management: Building, Measuring, and Managing Brand Equity, (Essex: Pearson Education Limited, 2013), pg. 115. Paul Temporal, Op.Cit., pg. 30. Jennifer Aaker, “Dimensions of Brand Personality”, Journal of Marketing Research, Vol. 34, No. 3, pg. 347. Audrey Azoulay and Jean-Noel Kapferer, “Do Brand Personality Scales Really Measure Brand Personality?”, Brand Management, Vol. 11, No. 2, pg. 145. Jennifer Aaker, Op.Cit., pg. 348. Maggie Geuens, et.al., “A New Measure of Brand Personality”, Research in Marketing, Vol. 26, pg. 100.